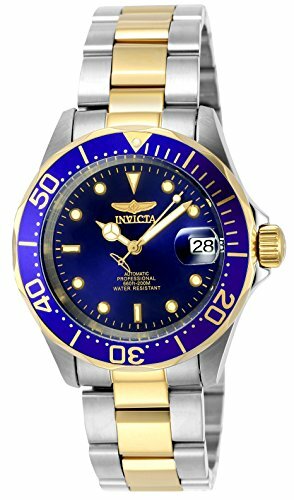 Invicta Men's 8928 Pro Diver Collection Two-Tone Stainless Steel Automatic Watch | What Should I Say? Bold styling combines with a classic design in this automatic watch #8928 from Invicta's Pro Diver collection. This sporty yet refined timepiece features a two-tone gold-plated and silver-tone stainless steel case, bezel, and bracelet strap. Protected by an anti-reflective mineral crystal with magnifier, a vivid blue dial showcases easy-to-read hands and markers, as well as a date display at three o'clock. Automatic 21-jewel movement is both shock resistant and reliable, while water resistance to 200 meters (660 feet) helps guard against the elements.